"By the end of Jacob Colier's set, it was difficult to imagine how anything could follow it, let alone equal it"
20 November 2018 (Toronto, ON) - Multi-instrumentalist, singer, composer, arranger, producer and 2-time GRAMMY winner Jacob Collier is embarking on a journey that few musicians have attempted. The follow-up to his 2016 debut album is Djesse, a 40-song, 4-volume exploration of the mind of one of music’s finest young talents that traverses different musical worlds in astonishing ways. 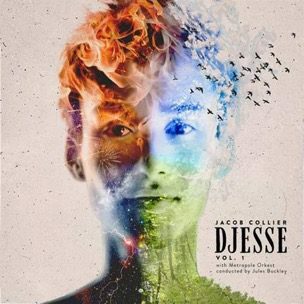 Djesse (Decca/Geffen/Universal Music Canada, the country’s leading music company) was written, produced and engineered by Collier, composed entirely during 2018, and features contributions from a global cast of his musical inspirations. Volume 1 of Djesse will be released December 7 with Volumes 2 through 4 to be released over the next several months. Listen to the first single, “With The Love In My Heart”, HERE and watch the official music video HERE. Djesse is a celebration of the imagination, a lushly vivid snapshot of Collier’s musical mind as he’s experienced the world in 2018. This project brings Collier’s bedroom, where he’s lived since age one and created and recorded most of his music, to the globe. In making it, he recorded in his bedroom as well as in NYC, Los Angeles, Nashville, Abbey Road, Holland, Morocco and Japan. Pre-order Volume 1 HERE. As the volumes are revealed, different textures, themes and sounds will be explored. Collier imagined Djesse as a grand journey through space and time, and each volume follows along this path. In addition, across the quartiles nearly two-dozen collaborators will be featured, from pop stars and folk songwriters to guitar wizards and soul singers. Collier stands at the centre of it all, putting himself in conversation with the musical world at large. Jacob Collier is largely self-taught and the viral YouTube videos he began posting from his London bedroom caught the attention of Quincy Jones and made him a star. He won two GRAMMYs and a Jazz FM Award for his 2016 debut album In My Room. His quick rise led to collaborations with Herbie Hancock and Hans Zimmer, a performance with Pharrell, a Ted Talk, and even the recomposition of Samsung’s ringtone. Collier made his BBC Proms debut in July and will performed at Spotify’s Secret Genius Awards on November 16.